The Super NES Classic Edition is a fun little retro video game console, but you probably shouldn’t buy it. We’re not just saying that because it’s out of stock in every store and you have to pay a premium to get one on Amazon. 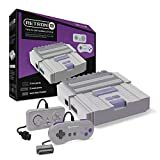 We’re saying that because the Hyperkin RetroN 2 Gaming Console costs just $41 and change, and it’s better than the Super NES Classic in every way. Instead of coming with just 21 games loaded on the device’s storage and no easy way to get more, the RetroN 2 has slots so you can play actual physical game cartridges. What’s more, it can play any NES game cart, not just SNES games!